RIO DE JANEIRO: Indian gymnast Dipa Karmakar scripted history+ as she became the first Indian to make the cut for the individual vault finals+ in her debut Olympic Games after finishing 8th in the qualifying round here. The Tripura-girl, who is the country's first woman gymnast to qualify for the Olympics, managed to perform her much-appreciated ' Produnova+ ' vault cleanly to secure 14.850 points after two attempts. It was a nervous wait for the Indian after that. She had ended sixth+ after the third of five sub-divisions. In the other routines, Dipa secured 11.666 for her effort on the uneven bars, scoring low on difficulty but decent on execution. Later, Dipa+ scored 12.866 for her performance on the balance beam. Description: Dipa Karmakar dropped to 8th eventually when Canadian Shallon Olsen's terrific effort of 14.950 rejigged the overall standings. But that was just about enough to secure her a place in the finals scheduled for August 14 as the top-8 made the cut for the medal round. 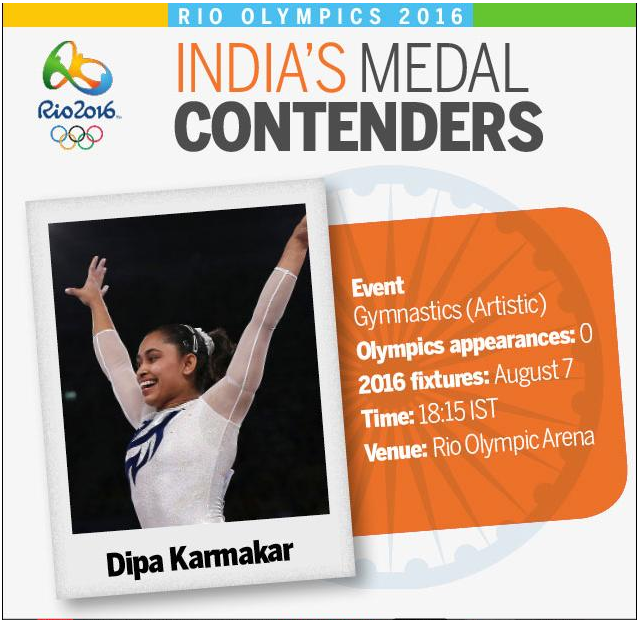 0 Response to "Rio Games: Dipa Karmakar qualifies for vault finals in Olympics"